July 1, 2015 – A number of the dust jets emerging from Rosetta’s comet can be traced back to active pits that were likely formed by a sudden collapse of the surface. 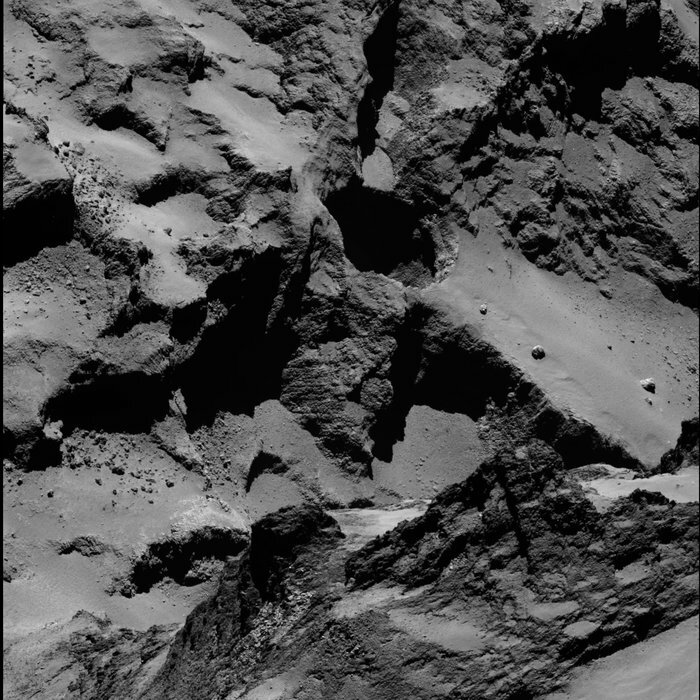 These ‘sinkholes’ are providing a glimpse at the chaotic and diverse interior of the comet. From a distance of a few hundred kilometers, Rosetta observes an intricate pattern of the dust jets emitted from the nucleus as they stream out into space. But now, thanks to high-resolution images from the OSIRIS camera from distances of just 10–30 km from the comet center last year, at least some of these dust jets can be traced back to specific locations on the surface, the first time this has ever been seen. Eighteen pits have been identified in high-resolution OSIRIS images of Comet 67P/Churyumov–Gerasimenko’s northern hemisphere. The pits are named after the region they are found in, and some of them are active. The pits are a few tens to a few hundreds of meters in diameter and extend up to 210 m below the surface to a smooth dust-covered floor. Material is seen to be streaming from the most active pits. “Although we think the collapse that produces a pit is sudden, the cavity in the porous subsurface could have growing over much longer timescales,” says co-author Sebastien Besse, of ESA’s ESTEC technical center in the Netherlands. One idea is that they have existed since the comet itself formed, as a result of very low-speed collisions between primordial building blocks tens to hundreds of meters in size. The collapse of the roof above such a void could then be triggered through weakening of the surface, perhaps by sublimation or via seismic shaking or impact from boulders ejected from elsewhere on the comet. If either of the latter two processes is the driving force, then the fact that the pits are not seen everywhere may indicate an uneven distribution of ices inside the comet. 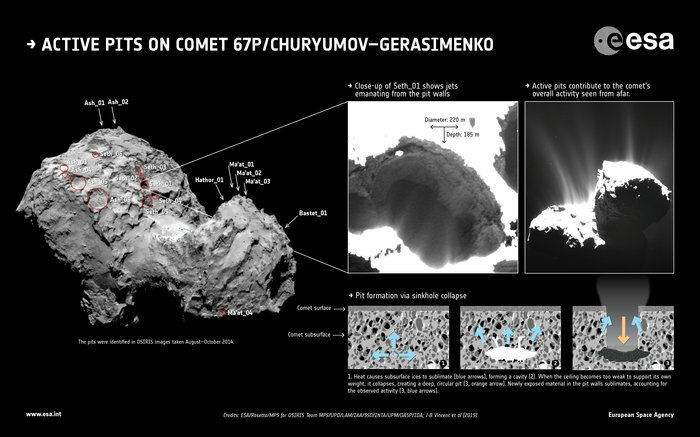 “Regardless of the processes creating the cavities, these features show us that there are large structural and/or compositional differences within the first few hundred meters of the comet’s surface and the cavities are revealing relatively unprocessed materials that might not otherwise be visible,” adds Sebastien. The authors note that the internal features revealed on the pit walls vary quite significantly from pit to pit, and include fractured material and terraces, horizontal layers and vertical striations, and/or globular structures nicknamed ‘goosebumps’. 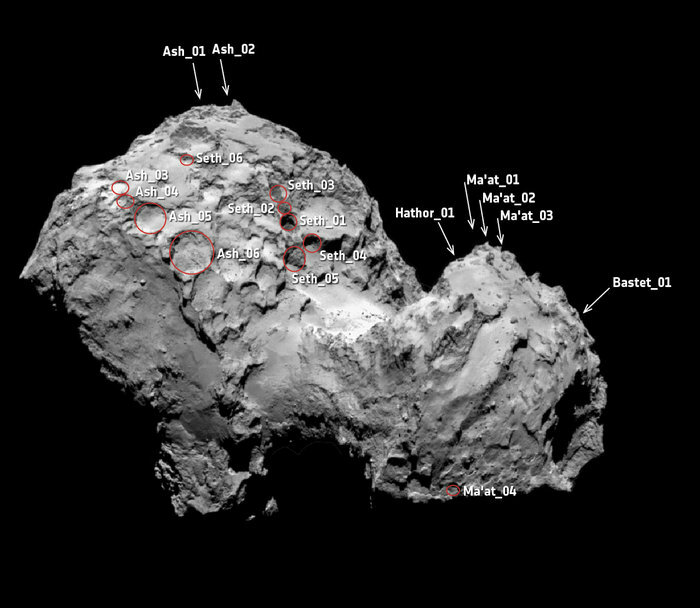 “We think that we might be able to use the pits to characterise the relative ages of the comet’s surface: the more pits there are in a region, the younger and less processed the surface there is,” explains Jean-Baptiste. The active pits are particularly steep-sided, whereas pits without any observed activity are shallower and may instead indicate regions that were active in the past. The team suggests that the active pits are the youngest, while middle-aged pits exhibit boulders on their floors that have fallen from the sides. Meanwhile, the oldest pits have degraded rims and are filled with dust. “We are continuing to analyse our observations to see if this theory holds true, and if this ‘time series’ is related to the internal thermal evolution of the comet, for example,” adds Sebastien. Rosetta did witness one outburst during its approach to the comet in April 2014, which is thought to have generated between 1000 kg and 100 000 kg of material. The authors state that a pit collapse could have been the driver for this outburst, but only a small fraction of the total volume of a typical pit could have been liberated at the time. For example, given the measured average comet density of 470 kg per cubic meter, the rapid evacuation of a typical large pit 140 m wide and 140 m deep would result in the release of around a billion kilograms of material, several orders of magnitude greater than was observed in April 2014. 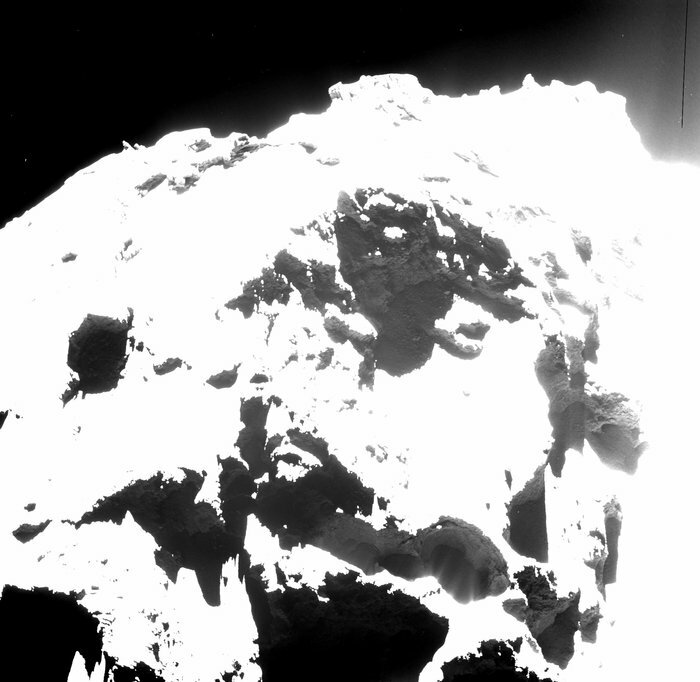 “We are very interested to see how these active pits evolve and maybe we’ll even witness the formation of a new pit,” says Matt Taylor, ESA’s Rosetta project scientist. “Being able to observe changes in the comet, in particular linking activity to features on the surface, is a key capability of Rosetta and will help us to understand how the comet’s interior and surface have evolved since its formation.